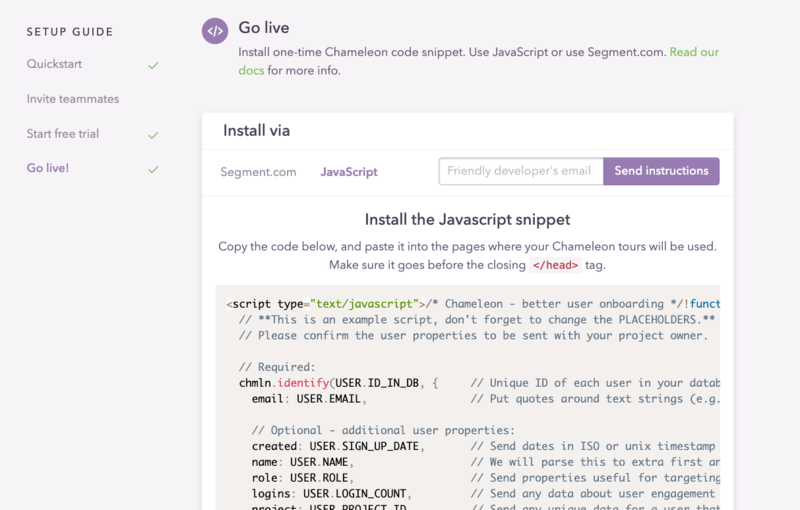 Unless your company uses Segment.com or Google Tag Manager, you can implement Chameleon manually with a code snippet. If you don't use Segment or GTM then you can install the code manually. This only takes a few minutes, and is similar to installing other JS snippets, such as for analytics or A/B testing tools. 2. Identifying users (with chmln.identify ) -- Information about users for showing tours, URL matching, targeting specific audiences and personalization. The user ID is *required for all users* (without it, they will not see any tours). The user email is necessary for some integrations to work correctly. // This is an example script, don't forget to change the PLACEHOLDERS. // Please confirm the user properties to be sent with your project owner. Your unique code snippet is available from your dashboard. Make sure the snippet is included on all private pages - typically before </head>. Use the snippet found in your dashboard here, because it contains your personalized. Ensure you replace USER.ID_IN_DB and the other PLACEHOLDERS with the variables your codebase uses for user IDs / records and the other data. You can install this on any subdomain (or locally), although we recommend installing directly on production. Learn more here. Plan which user data to include -- discuss with your team what would be useful for targeting Chameleon experiences or for personalizing content. You can also send other user data, for example user actions ("events") inside your product, via our API. You have options to send data via our front-end JS API or back-end REST API. To learn more about how to send data to Chameleon, read this.